We’re about to see the first close-up of a black hole. The Event Horizon Telescope, a network of eight radio observatories spanning the globe, has set its sights on a pair of behemoths: Sagittarius A*, the supermassive black hole at the Milky Way’s center, and an even more massive black hole 53.5 million light-years away in galaxy M87. In April 2017, the observatories teamed up to observe the black holes’ event horizons, the boundary beyond which gravity is so extreme that even light can’t escape. After almost two years of rendering the data, scientists are gearing up to release the first images in April. Here’s what scientists hope those images can tell us. What does a black hole really look like? 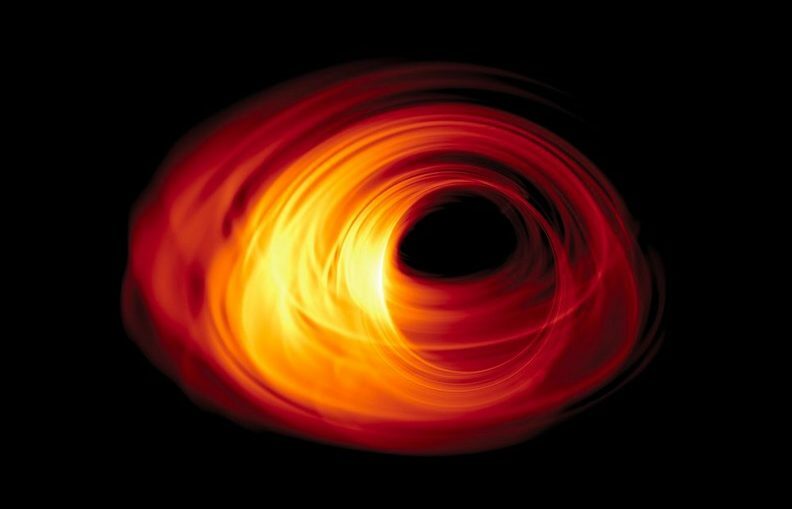 Black holes live up to their names: The great gravitational beasts emit no light in any part of the electromagnetic spectrum, so they themselves don’t look like much. But astronomers know the objects are there because of a black hole’s entourage. As a black hole’s gravity pulls in gas and dust, matter settles into an orbiting disk, with atoms jostling one another at extreme speeds. All that activity heats the matter white-hot, so it emits X-rays and other high-energy radiation. The most voraciously feeding black holes in the universe have disks that outshine all the stars in their galaxies. The EHT’s image of the Milky Way’s Sagittarius A*, also called SgrA*, is expected to capture the black hole’s shadow on its accompanying disk of bright material. Computer simulations and the laws of gravitational physics give astronomers a pretty good idea of what to expect. Because of the intense gravity near a black hole, the disk’s light will be warped around the event horizon in a ring, so even the material behind the black hole will be visible. And the image will probably look asymmetrical: Gravity will bend light from the inner part of the disk toward Earth more strongly than the outer part, making one side appear brighter in a lopsided ring. Does general relativity hold up close to a black hole? The exact shape of the ring may help break one of the most frustrating stalemates in theoretical physics. The twin pillars of physics are Einstein’s theory of general relativity, which governs massive and gravitationally rich things like black holes, and quantum mechanics, which governs the weird world of subatomic particles. Each works precisely in its own domain. But they can’t work together. “General relativity as it is and quantum mechanics as it is are incompatible with each other,” says physicist Lia Medeiros of the University of Arizona in Tucson. “Rock, hard place. Something has to give.” If general relativity buckles at a black hole’s boundary, it may point the way forward for theorists. Since black holes are the most extreme gravitational environments in the universe, they’re the best environment to crash test theories of gravity. It’s like throwing theories at a wall and seeing whether — or how — they break. If general relativity does hold up, scientists expect that the black hole will have a particular shadow and thus ring shape; if Einstein’s theory of gravity breaks down, a different shadow. Medeiros and her colleagues ran computer simulations of 12,000 different black hole shadows that could differ from Einstein’s predictions. “If it’s anything different, [alternative theories of gravity] just got a Christmas present,” says Medeiros, who presented the simulation results in January in Seattle at the American Astronomical Society meeting. Even slight deviations from general relativity could create different enough shadows for EHT to probe, allowing astronomers to quantify how different what they see is from what they expect. Do stellar corpses called pulsars surround the Milky Way’s black hole? Another way to test general relativity around black holes is to watch how stars careen around them. As light flees the extreme gravity in a black hole’s vicinity, its waves get stretched out, making the light appear redder. This process, called gravitational redshift, is predicted by general relativity and was observed near SgrA* last year. So far, so good for Einstein. An even better way to do the same test would be with a pulsar, a rapidly spinning stellar corpse that sweeps the sky with a beam of radiation in a regular cadence that makes it appear to pulse. Gravitational redshift would mess up the pulsars’ metronomic pacing, potentially giving a far more precise test of general relativity. Despite careful searches, no pulsars have been found near enough to SgrA* yet, partly because gas and dust in the galactic center scatters their beams and makes them difficult to spot. But EHT is taking the best look yet at that center in radio wavelengths, so Ransom and colleagues hope it might be able to spot some. ONE OF MANY? The pulsar PSR J1745-2900 (left in this illustration) was discovered in 2013 orbiting roughly 150 light-years from the black hole at the center of the galaxy. 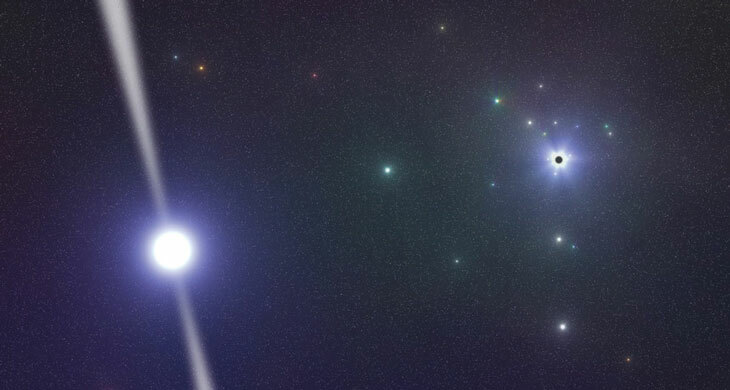 That’s too far to use it to do precise tests of general relativity, but astronomers hope that the pulsar’s existence means the Event Horizon Telescope will find many more even closer to the black hole. How do some black holes make jets? Some black holes are ravenous gluttons, pulling in massive amounts of gas and dust, while others are picky eaters. No one knows why. SgrA* seems to be one of the fussy ones, with a surprisingly dim accretion disk despite its 4 million solar mass heft. EHT’s other target, the black hole in galaxy M87, is a voracious eater, weighing in at about 2.4 trillion solar masses. And it doesn’t just amass a bright accretion disk. It also launches a bright, fast jet of charged subatomic particles that stretches for about 5,000 light-years. EHT’s measurements of M87’s black hole will help estimate the strength of its magnetic field, which astronomers think is related to the jet-launching mechanism. And measurements of the jet’s properties when it’s close to the black hole will help determine where the jet originates — in the innermost part of the accretion disk, farther out in the disk or from the black hole itself. Those observations might also reveal whether the jet is launched by something about the black hole itself or by the fast-flowing material in the accretion disk. Since jets can carry material out of the galactic center and into the regions between galaxies, they can influence how galaxies grow and evolve, and even where stars and planets form.